At last, a silent fanless Kaby Lake 7th Gen quad core i5 PC. Uses Akasa Euler S fanless case. Built to order. Usually ships within 3 days. 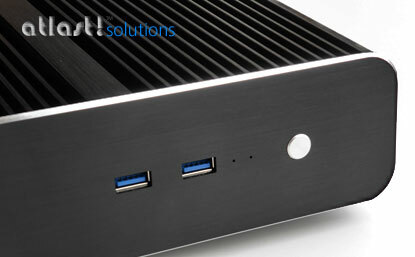 This custom made fanless thin mini-ITX PC uses all the latest components to give you a powerful PC beyond expectations. 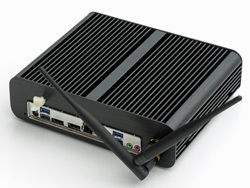 The latest Quad Core i5-7400T processor gives performance of a high end large PC, yet it runs so cool that it can be fitted into this fanless mini-PC, consuming very little electrical power. VESA (100x100) mounting screws are included, so the PC can be mounted onto the back of LCD monitors that have VESA mounting holes. Rubber feet are supplied for use on a desktop. This is a special offer configuration. Please see our other listings for up to 32GB DDR4 Memory and 2TB SSD/HDD.